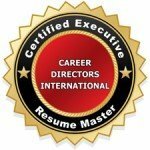 Congratulations on electing to renew your Certified Executive Resume Master (CERM) credential. All you need to do for renewal is to submit four (4) examples of real-life executive resumes from your professional portfolio. – On the final page of each resume, please include a brief description for each one of (a) the project situation / challenge, (b) explanation of choices for document style and information inclusion and (c) job seeker results (if known).